Providers of material handling solutions are feeding a growing appetite for automation in the warehouse and distribution center these days, with a special interest in robotics. Research into and development of robotics applications for everything from picking and packing to truck loading and unloading is on the rise, and the trend shows no sign of slowing down, says Crystal Parrott, vice president of the Robotics Center of Excellence at the Grand Rapids, Mich.-based systems integrator Dematic. "It's a fascinating time to be in robotics," says Parrott, whose group works with customers to develop automated solutions that incorporate robotic bin picking and palletizing. She says advances in vision and gripping technology, computing power, and artificial intelligence are helping to propel robotics research and development, and that labor challenges, e-commerce, and omnichannel business trends are driving customers' interest in applying high-tech solutions throughout the warehouse and distribution center. And the timing couldn't be better, as warehouses and DCs morph into fast-paced fulfillment centers that offer increasingly quick turnaround times. Finding better, more efficient ways to move products throughout the facility is at the top of just about everyone's priority list, it seems. "The industry as a whole is going to continue to evolve," Parrott says. "And we need solutions that can help in all areas." Underlying the growing interest in robotics is the sheer need to get more orders out the door faster in today's environment. Intense competition in the e-commerce sector, a rise in the number of stock-keeping units (SKUs) companies must keep on hand, and advancing technology in general are all causing companies to move toward automated warehouses and DCs, and robotics is a natural extension of that trend. A study released this spring by market researcher Allied Market Research forecasts a nearly 12-percent compound annual growth rate in the global warehouse robotics market between 2016 and 2023, reaching a market value of $5.2 billion. Most of those solutions will be used to address e-commerce business, where demand for automation is soaring. The Allied Research report shows that e-commerce as an industry vertical accounts for the largest share of the warehouse robotics market today, followed by the automotive industry. The study also found that pick and place is the most common function performed by warehouse robotics in those environments, followed by packaging. Parrott says labor challenges are having a considerable influence on robotics growth as well. As volume and throughput demands increase, organizations need more employees to handle the work—and those employees can be tough to come by in today's tight labor market, where unemployment is low and the need for both skilled and unskilled labor is rising across manufacturing, industrial, and retail sectors. Finding enough workers can be especially difficult for e-commerce retailers looking for seasonal warehouse help. Robotics hold the potential to address such problems on a large scale because they can be used to perform repetitive tasks such as picking, freeing up workers for other tasks throughout the facility, Parrott explains. But the technology still has a long way to go to address the variety of products in the market with the reliability and adaptability of a human. Today's robotic picking solutions do a good job of moving products from one place to another, but further research and development will be needed before they can perform some of the more complex, precision-based tasks required in dynamic picking environments. "At the moment, most of the piece-picking robotic applications are using end effectors with either vacuum cups or a simplistic 2/3/4 finger gripper. The robot path planning provides a centralized pick point and general extraction path to avoid collision with the bin or objects in the environment," Parrott explains. "This will work on a large number of products, [but] some products need to be picked up in a specific way and extracted [so as] not to entangle or damage other items next to them." A top-heavy product such as a hammer, for instance, must be gripped closer to the head. Further complicating matters, the handle or nail remover portion of the head may get tangled or buried beneath other items, making the choice of which one to pick next more complex; the extraction motion from the bin will be more complex as well. Such actions require more advanced vision and path planning solutions, Parrott says. "Additionally, most [robotic picking] applications being demonstrated [today] pick and drop the product in an order tote or container," she says. "If a large variety of products need to be [deposited] in a specific place or in a defined orientation so that they are not damaged, this requires more advanced planning on the placement side." Parrott says she has no doubt the technology will get there, and she also points to growing investment in "mobile bots"—robots that move throughout a facility as opposed to picking arms and other stationary solutions—as another particularly hot area of research today. "You're seeing advances in automating 'goods to person' [picking]," she says. "There is a lot of focus in this area, and we will see even more development in the years ahead." A separate industry study underscores the point. Industry research firm Interact Analysis released a study this spring predicting that the value of the autonomous mobile robots (AMRs) market will grow to $7 billion in 2022 from $1.1 billion in 2017. The burgeoning e-commerce sector, mass personalization of goods, and a shortage of low-cost labor are driving the trend, the research firm said. Deck-load mobile robots—those that have decks or flat surfaces to transport pallets or cartons—are the most common, with 180,000 forecast to be shipped in 2022. Mobile robots with mounted arms are less commonly used, but are increasingly entering the research and development phase. Interact Analysis predicts that 12,000 of these types of robots will be sold in 2022. Logistics is the fastest-growing vertical market for mobile robots, with revenues predicted to jump to $3 billion in 2022 from $300 million in 2017. Mobile robot use in the manufacturing sector is expected to soar as well, with revenues increasing 75 percent to more than $3 billion by 2022. Bastian's Ultra mobile robots for trailer loading and unloading are engineered for the narrow space and high reach of transport vehicles. They are being used in pilot programs this summer, with a full commercial rollout expected to start in the first quarter of 2019. 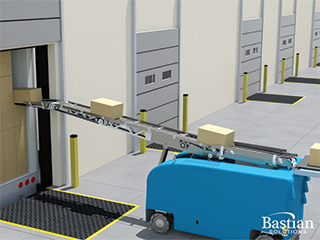 One of the newest areas for robotics is the loading dock, a place that's ripe for efficiency improvements and innovation, according to Joe Zoghzoghy, Ph.D., mobile robotics manager for material handling solutions provider Bastian Solutions. Bastian introduced its Ultra mobile robot for truck trailer loading and unloading at the Modex trade show in Atlanta this spring; the product is being used in pilot programs this summer, with a full commercial rollout expected to start in the first quarter of 2019. Ultra robots are engineered for the narrow space and high reach of transport vehicles, ranging from extended vans to intermodal containers. The robots drive directly into the trailer, picking up as many as 20 cases per minute each, and can be integrated with a company's existing warehouse management and warehouse control systems. Zoghzoghy says this type of robotics solution directly addresses the many labor-related challenges companies face on the loading dock, including harsh temperatures and heavy lifting that leave workers prone to injury and raise a host of safety concerns, including repetitive stress injuries. "It's hard to hire people for this type of environment," Zoghzoghy says. "It makes sense that organizations seek to solve some of these problems with automation." Labor-related cost pressures are another concern. Increases in the minimum wage, overtime, and seasonal demands can strain budgets, giving organizations yet another reason to consider automating certain warehouse and distribution center tasks. A short payback period is crucial to making the math work on such investments, Zoghzoghy adds, noting that companies should expect a one- to two-year payback when implementing any automated or robotics solution. As technology advances and costs come down, he says, more companies will be able to achieve that goal. "In general, automation will be very helpful to improve efficiency, bring costs down, and create a safer environment for workers," Zoghzoghy says. "Especially as the cost of technology comes down, you'll see these solutions integrated even more." Feedback: What did you think of this article? We'd like to hear from you. DC VELOCITY is committed to accuracy and clarity in the delivery of important and useful logistics and supply chain news and information. If you find anything in DC VELOCITY you feel is inaccurate or warrants further explanation, please ?Subject=Feedback - : Robotics on the rise">contact Chief Editor David Maloney. All comments are eligible for publication in the letters section of DC VELOCITY magazine. Please include you name and the name of the company or organization your work for.